Construction of Duluth’s first ore dock began in 1884 in anticipation of iron ore from Charlemagne Tower’s mines on the newly opened Vermillion Iron Range. Unfortunately for Duluth, work was forced to stop after Tower announced he would ship his ore through Agate Bay, today’s Two Harbors. The Duluth dock was finally completed in 1893 after Duluth’s Merritt brothers opened mining on the Mesabi Iron Range. The wooden dock, built by the Duluth, Missabe & Northern Railway, stretched into the bay at Thirty-Third Avenue West, had a capacity of 57,600 tons, and received its first load of ore on July 22, 1893. A second wooden dock went up west of the first in 1896, a third in 1900, and a fourth in 1906, the year after the first dock closed due to its insufficient size. At 2,304 feet in length and a capacity of 76,800 tons, Dock #4 was the largest wooden ore dock ever built. 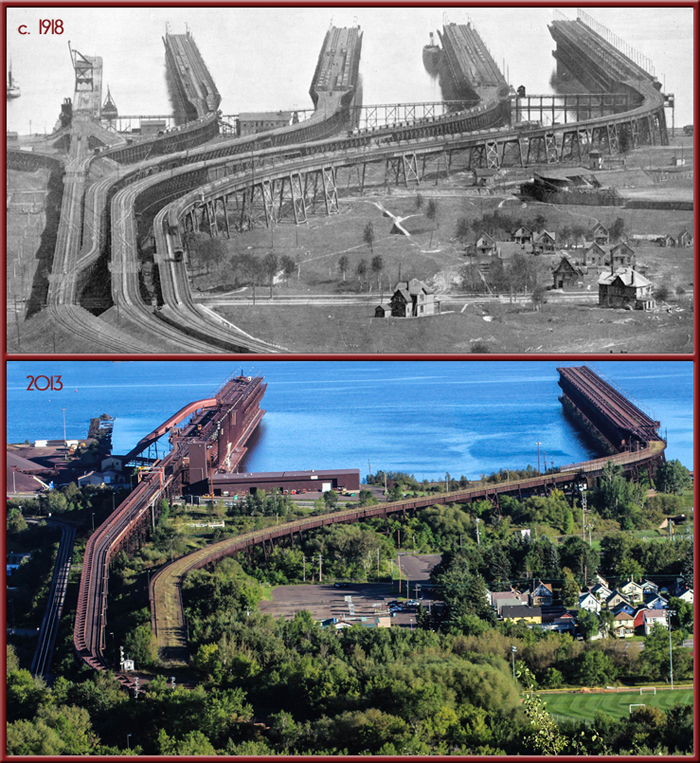 Duluth’s fifth ore dock—made of steel—went up in 1914. The Zenith City’s final ore dock was built in 1918. The largest ore dock in the world, Dock #6 was made of steel and had a capacity of 153,600 tons. Duluth’s row of storage and loading structures stretched from Thirty-Third to Thirty-Fifth Avenues West. The first two docks were simple affairs, and ore was simply dumped from train cars into vessels for shipment to eastern steel plants. The later docks were specifically designed to take ore from train cars, store it if need be, and load it into ore boats. At the dock, the carloads of ore were dumped into pockets along the dock; a chute carried the ore from the pockets into the cargo holds of ore boats. When the ore-laden boats reached steel-making centers along the Lake Erie rust belt, Hulett ore offloaders would pull ore from the ships’ holds ten tons at a time. A Hulett unloader could empty ore boats like the Edmund Fitzgerald, which held 25,000 tons of ore, in five to ten hours; before Huletts came along in 1900, the process would take days. When the last Great Lakes ore boat was converted to a self-unloader in 1992, the Huletts became obsolete. 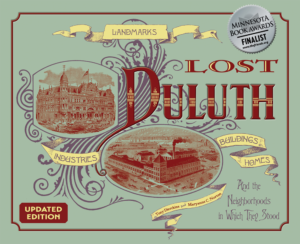 By 1938, ore demand had lessened and the DM&N was down to two docks, #5 and #6, and the railroad merged with the Duluth & Iron Range Railway to become the Duluth, Missabe & Iron Range Railway in 1938. That same year U.S. Steel merged the DM&N with the Duluth & Iron Range Railway to form the Duluth, Missabe & Iron Range Railway. U.S. Steel had acquired the DM&N in 1901 from John D. Rockefeller, who had taken control of it when the Merritt Brothers’ finances went sour; that same year the firm purchased the D&IR from Illinois Steel, which had acquired the railroad from Tower’s Minnesota Iron Company in 1887. The docks were built or dismantled according to demand. The two smallest docks went first: Dormant since 1905, Dock #1 came down in 1913; Dock #2 closed two years later. Despite a 1905 expansion, Dock #3 lasted only until 1919. Dock #4 served until 1927. Docks #5 and #6 remain today, although Dock #5 is no longer in use. The docks are now owned by Canadian National Railway.